Add an elegant note to any menu with this small brioche rolls recipe. Rich and eggy, these little bread are perfect with a steamy mug of coffee for breakfast, or as a surprise accompaniment to a big, family dinner. Liven up a simple soup with these rolls alongside. They're perfect for party guests, because they take only 20 minutes of active preparation and they make such a beautiful, elegant presentation.They're perfect for party guests, because they take only 20 minutes of active preparation and they make such a beautiful, elegant presentation. Cook's note: Plan ahead of time to make these. While these petite brioche rolls take only 20 minutes of preparation, plus baking time, they require at least 6 hours for the dough to rest and rise in the refrigerator. This proving cannot be rushed so plan and prepare ahead of time. You'll be glad you did. In a large bowl, dissolve the yeast and sugar in the warm water for 5 minutes. Add the eggs, beating after each addition, until the mixture is thoroughly combined. Add half of the flour and all the salt to the eggs and continue beating the mixture on low speed for 5 minutes. Add the remaining flour and beat on low speed for an additional 5 minutes. Cover the dough loosely and refrigerate it for at least 6 to 8 hours, up to 24 hours. Allow the dough to come to room temperature. Beat the softened butter into the dough for 2 to 3 minutes, adding a few tablespoons of additional all-purpose flour, if needed, to make a soft, elastic texture. Lightly butter each brioche mold. Divide the dough into 18 to 20 balls, depending on how many brioche molds are available. Remove 1/4 of the dough from each piece and roll it into a smaller ball. Place the larger piece of dough into each mold and top it with the miniature ball. Repeat the process with each remaining brioche mold. Allow the dough to rise, covered loosely, in a warm place on a baking sheet for 90 minutes, or until it is doubled in volume. 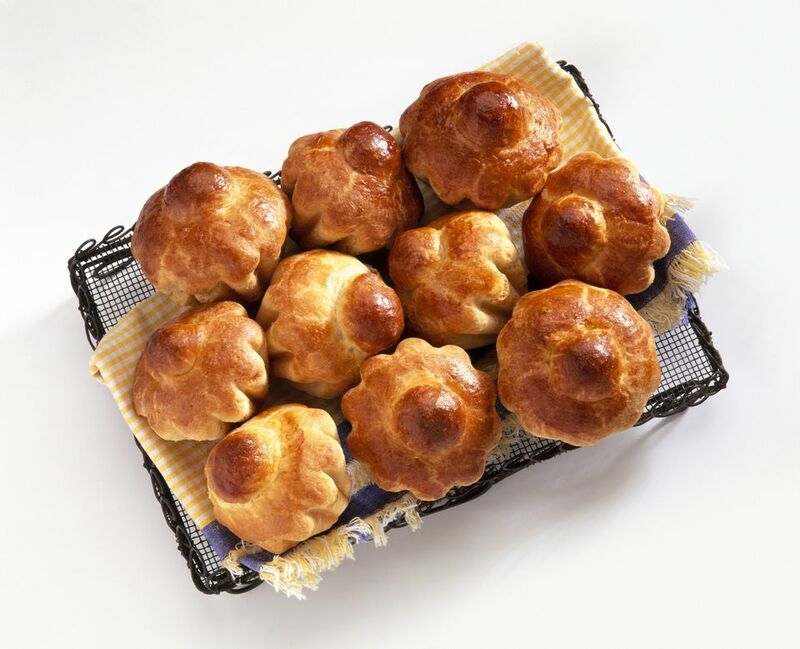 Brush the brioche with the egg wash and bake the rolls for 20 to 24 minutes, until they are golden brown. Serve the petite brioche rolls within 1 day for the best quality. This miniature brioche rolls recipe makes 18 to 20 servings.